Outgoing Colombian President, Álvaro Uribe, dropped a figurative bomb in the Andes on Thursday, July 22, just weeks before the scheduled inauguration of President-elect Juan Manuel Santos, Uribe’s former Defence Minister. At the behest of Bogotá, an extraordinary session of the Permanent Council of the Organization of American States (OAS) was convened to hear Colombia’s accusations that there are “1,500 guerrillas and dozens of encampments of the Revolutionary Armed Forces of Colombia (FARC) and the National Liberation Army (ELN) in Venezuela,” both groups deemed to be “terrorist” organizations by Colombia and the United States. In response, Venezuelan President Hugo Chávez – flanked by visiting Argentine soccer sensation and leftist celebrity, Diego Maradona – announced on Venezuelan television that he had cut all diplomatic relations with Colombia. The Venezuelan embassy in Bogotá was closed and Colombian diplomats in Caracas were given 72 hours to vacate the country. The Venezuelan armed forces, particularly those 20,000 troops stationed along the Colombian-Venezuelan border, were put on “maximum alert,” given the gravity of the accusations levelled against Venezuela by the Uribe government. Chávez accused Uribe of using the alleged guerrilla encampments as a pretext to bring the two countries to war. This is a dangerous statement to say the least. The harbouring of “terrorists” was the pretext for the initial invasion of Afghanistan eight years ago. According to the Obama team, Venezuela has obligations to the “international community” while Colombia – the leading practitioner of state terror against its civilian population in the entire region – is immune from such obligations. This is the standard pattern for American presidencies in Latin America, where there are loose for rules friendly states and arbitrary ones for enemies. Nowhere has this been clearer in the last few years than in the reaction to the March 2008 Colombian Air-Force bombing of a FARC encampment in Angostura, Ecuador, which left 26 people dead, among them FARC leader Raúl Reyes. The grossest violation of the sovereignty of one South American republic by another in recent memory, it was conducted under the hand not only of Uribe, but also Santos, as Minister of Defence. Given the United States’ ex post facto justification of Colombia’s invasion of Ecuadorean territory in 2008, it is little wonder today that the Venezuelan President is taking accusations of harbouring terrorists extremely seriously. U.S. State department spokesperson, Phillip Crowley, signalled continuity with Obama and Clinton’s earlier views, saying that he supported Colombia’s proposal to have an international team of investigators go into Venezuela and investigated the alleged camps. “There should be an investigation. We think Venezuela has the responsibility to respond swiftly to the important information presented yesterday by Colombia,” he said. The relationship between Caracas and Bogotá has been marked by animosity since Chávez and Uribe first assumed office in 1999 and 2002 respectively. But the scale and intensity of mutual vexation have escalated since 2007. In 2008, for example, Chávez had been attempting to mediate a negotiated settlement with the FARC to release some of the hostages held by the guerrilla organization, but this process was peremptorily shut down by Uribe – “no negotiations with terrorists” was the subterfuge employed by the Colombian administration to justify its penchant for permanent war at home. In March that year, relations between the two countries reached their nadir – prior to the current imbroglio – following the Colombian bombing of Ecuadorean territory. Venezuela mobilized troops to its borders and prepared for what the Chavez administration saw as a potential imminent Colombian invasion of its territory. In late July, 2009 Chávez withdrew the Venezuelan ambassador from Bogotá and froze diplomatic and commercial relations with Colombia in response to further aggressive statements and actions by Uribe. In November 2009, the war of words played themselves out in the halls of the OAS. Colombia first formally condemned Venezuela for various war threats it alleged were being issued against Colombia. This was followed in late November by Venezuela’s formal complaint before the OAS that a military pact between Colombia and the USA – including the installation of seven new U.S. military bases in the country – was tantamount to a “threat of war” against Venezuela. Throughout the first half of 2010, the diplomatic crisis has hardly abated. Uribe and Chávez engaged in a veritable war of words at the gathering of the Río Group in Mexico in February, and in April Chávez, commenting on the forthcoming Colombian elections, suggested that a victory for Santos – i.e. a continuation of Uribist revanchism – could “generate a war” in the region. In late June, Santos did indeed win the presidential elections. He has been quick to adopt a less intransigent sophistic posture than the Uribe norm, inviting the governments of Ecuador and Venezuela, for example, to “open paths to cooperation in the future.” In response, Chávez also changed tune, congratulating Santos on his victory and, in the course of the most recent dispute, emphasizing the ostensible distance between the at-least-potentially peaceful politics of Santos and those of militaristic Uribe. However, just as Barack Obama’s election did not alter the grand economic and geopolitical imperatives of the imperial strategy of the U.S., we should not expect great change in Colombia once Santos assumes office. It is worth recalling that Santos’ platform was an explicit continuation of Uribe’s model of “democratic security,” although under the half-guise of “democratic legality.” Santos was, without doubt, the candidate of Empire in these elections and will be expected to do its bidding. The real danger represented by Santos is that even prior to inauguration he is proving to be skilful in the manipulation of Latin American opinion through a change in Colombian diplomatic style, from Uribe’s frothing at the mouth, to an Obama-like mirage of rapprochement with long time foes. This is evident, for example, in Lula’s public expectations that Colombian relations with its South American neighbours will change once Uribe is out of office. Kirchner of Argentina shares such illusions. “Why shouldn’t we re-establish dialogue to see how we can resolve the problem of the presence of terrorists in Venezuela,” Santos told the Ecuadorean daily El Comercio on July 19, 2010. Here we find the smoke and mirrors of the incoming administration. Rhetoric of negotiation and compromise is maintained with centre-left neighbours with the intent of drawing them toward warmer relations with the Colombian state, while the fundamental premise of ongoing hostility toward Venezuela – “the problem of the presence of terrorists in Venezuela” – is never abandoned. With Uribe’s last act against Venezuela, Santos will be able to argue that the train of hostility with Colombia’s neighbour has already been set in motion and that he has been left with no other choice than to navigate the same path more or less, albeit with greater diplomatic subtlety. From this perspective, the increasing isolation of the Venezuelan process is achieved through the legitimation of the Santos regime in Colombia by centre-left states, while the rearticulation of right-wing forces across the region continues apace – the Honduran coup of June 2009 and its consolidation in January 2010 with the inauguration of Porfirio “Pepe” Lobo; the destabilization campaigns against the Morales and Chávez governments in Bolivia and Venezuela respectively; the election of Sebastian Piñera in Chile; the militarization of Mexican politics and society under Felipe Calderón; the maintenance of right-wing governments in Panama and Peru, with the possibility of electoral victory in the near future by the far right in Brazil; the possibility of significant setbacks for the Bolivarian process in Venezuela in the September congressional elections; the remobilization of the Fourth Naval Fleet by the U.S. and its establishment of seven new military bases in Colombia; and so on and so forth. On Thursday, July 29, foreign affairs representatives of various South American states met at an emergency assembly in Ecuador of the Union of South American Nations (UNASUR) in an attempt to deescalate the conflict between Venezuela and Colombia. Virtually nothing came of the gathering. Colombian foreign minister, Jaime Bermúdez, participated, but essentially dismissed it as irrelevant even before the meeting had started. In this week’s issue of his regular newspaper column, Chávez suggests that the ultimate objective of his government is to stop the “warmongering madness” of Uribe, and to prevent the Colombian President from committing his last crime, “of dragging two sister peoples into war.” In defence against any possible military threat, Chávez has continued to mobilize Venezuela’s air and ground forces along the border with Venezuela, while maintaining that peace and stability in the region can only be arrived at through sincere negotiation. The future will depend on the peoples of South America opting “either to practice peace or to maintain an environment of confrontation and elevated risk of war in the region,” according to the Venezuelan president. A negotiated settlement without imperial interference is required in the short term to prevent the risk of war. International solidarity with Venezuela on the part of other Latin American peoples and states, and all progressives in the Global North, is the pressing task of the moment. 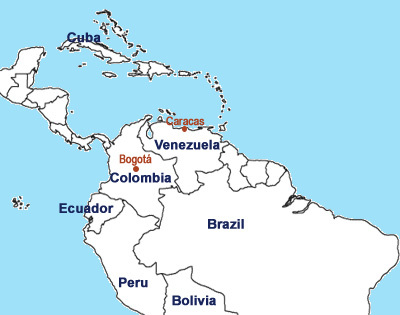 In the long term, the Colombian people will have to extract themselves from grips of U.S. imperialism, starting with the elimination of the contracts for the seven U.S. military bases – taking as precedent the Ecuadorean move against U.S. military presence in their country recently. There can be no illusions that Santos will take any of these necessary steps. He represents the continuity of Uribe’s aggressive foreign relations abroad, accompanied by the equivalent dose of state and paramilitary terrorism at home. Public discourse in the United States and Canada has been commandeered by maniacal rants against the Venezuelan dictatorship and copious praise for the democratic virtues of Uribe’s Colombia. Turning the tide against this misinformation barrage will be an epoch struggle but it is one we must win if we are to prevent the possibility of war against Venezuela, and its justification by the aggressors. This is the immediate agenda for peace. It is also the precondition for the possibility of justice in Latin America’s future. Jeffery R. Webber teaches politics at the University of Regina, Canada. In September he will begin teaching politics at Queen Mary University of London. He is the author of Red October: Left-Indigenous Struggles in Modern Bolivia (2010), and From Rebellion to Reform in Bolivia: Class Struggle, Indigenous Liberation and the Politics of Evo Morales (2011). He is currently in Ecuador.